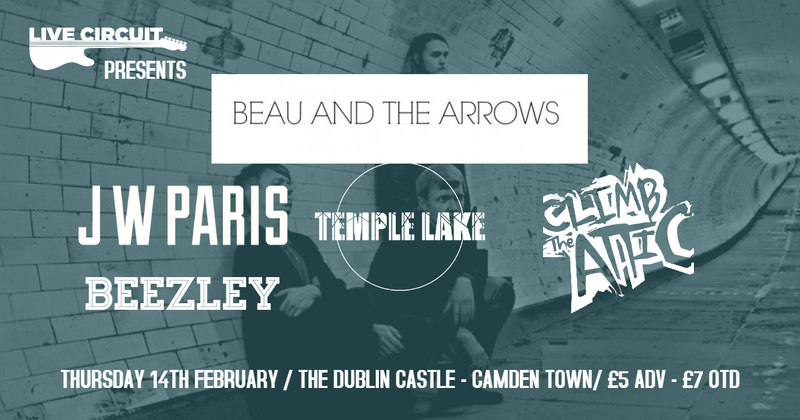 Live Circuit Presents: Beau and the Arrows, JW Paris, Temple Lake, Climb The Attic and Beezley. With a new line up and new material, Beau and the Arrows have finally retured in 2016 after a 5 year hiatus. The single "E.A.S.Y" was the first track to be released from the fourth coming debut Album. Temple Lake fuses "the riff-heavy stadium rock of the 70s with the grit and anger of the 90s grunge scene. Being heavily influenced by rock legends such as: the doors, Led Zeppelin and Pearl Jam the band also dwells in the psychedelic finishing the mix with a solid dose of 2018. Their ballsy new sound builds on their influences ranging from B.R.M.C, The Dandy Warhols, The Rolling Stones, Jack White, Blur and Suede, which in turn gives them a raw anglo-american, alt-rock swagger with the vocal delivery, phrasing and harmonies that wouldn’t sound out of place in the brit pop hey day. Formed in 2017, Beezley are an indie-rock band who take influence from acts such as The Beatles, Oasis and The La's. Beezley are currently recording new material earmarked for release in the first half of 2018. Night buses run past and near the venue. It's located a 5 minute walk away from Camden Town station.